We are happy to announce that N-iX was recognized for its excellence in servicing its clients by Clutch and named one of the 2018 Top B2B Companies in Ukraine. In its yearly evaluation of the top-performing B2B service companies, Clutch showcases the most eligible services per country. 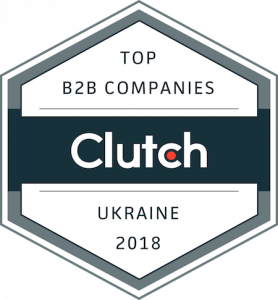 Being the biggest B2B platform, Clutch manages its comprehensive data to enlist annually the top 500 B2B companies in Ukraine. This year list includes N-iX as one of the top performers within B2B client model, which is an additional recognition for N-iX company for being not only a high-tier software development services provider but also a dedicated business with mature network and communications. The Polish and Ukrainian companies featured in today’s report not only managed to distinguish themselves from the competition but also proved their ability to deliver high-quality services to a variety of clients around the world. In 2017 N-iX also made it to similar Clutch listings. N-iX was named among Top Ukrainian Web & Software Developers and recognized as Leading Software Development Company in Poland.